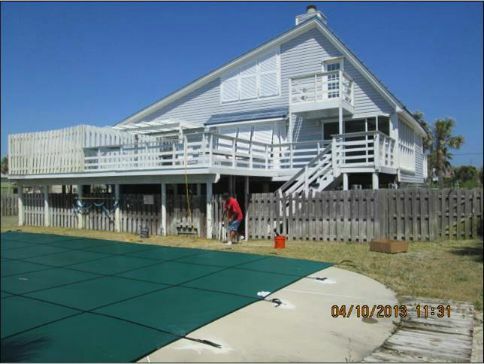 Safety covers are great to close a pool during winter or for vacant house. 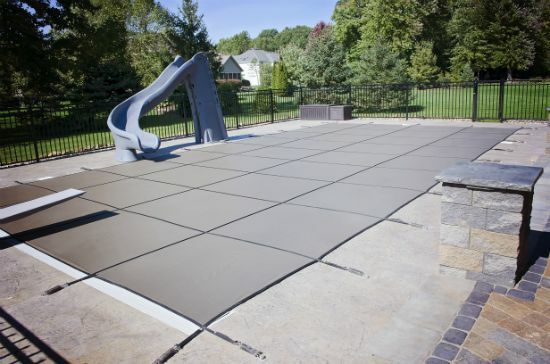 Pool Cover protects Children as well as keeps your pool clean. 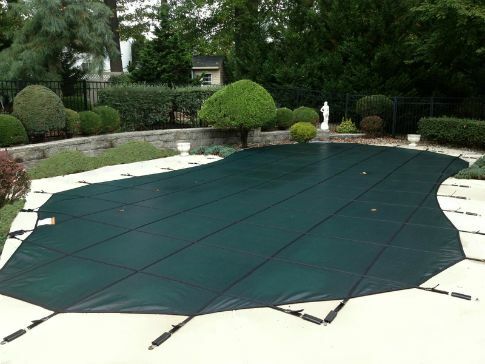 Pool Cover sized to fit any swimming pool. 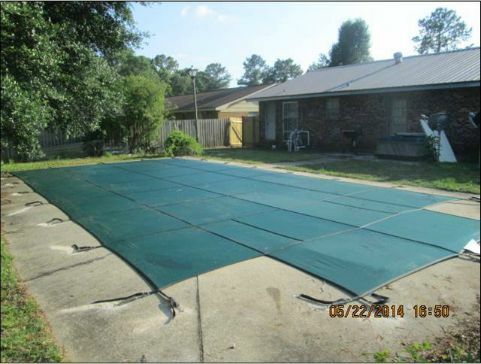 Pool Cover helps protect your pool. Ultimately the choice is the customers and I will be happy to assist in any way we can in the decision making process. All Pool Covers are custom fitted to your pool. 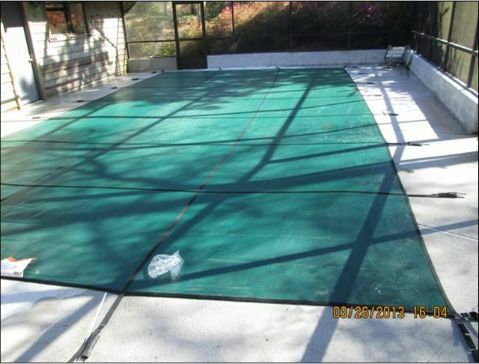 Original Mesh Green Pool Safety Cover. Original Mesh Tan Pool Safety Cover. Sun Block Mesh Gray Pool Safety Cover. 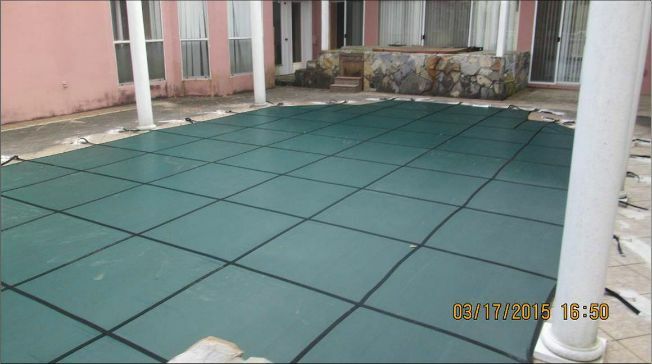 Sun Block Mesh Green Pool Safety Cover. 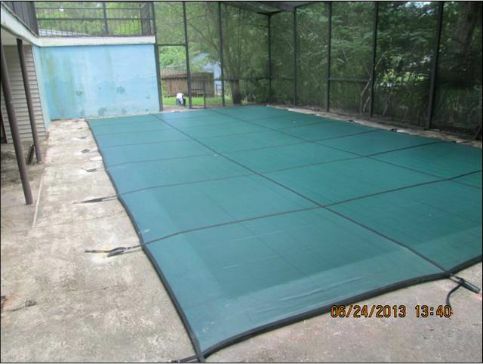 Pool Guard of Gulf coast has access to standard shape swimming pool covers ranging from a rectangle swimming pool or a rectangle pool with side step out available. Sometimes we encounter more complex swimming pools that need to have a custom measurement in order to have the cover (this is know as taking AB measurements). We will coordinate a time to do a site visit to take AB measurements of the pool. This process can take from thirty minutes to an hour depending on the shape of the swimming pool, ladders, slides, grottos and of course the weather. Once we have all measurements entered into our portable CAD (computer aided design) program, we will then email it to the factory for the engineers to review, design and provide a quote. This process usually takes no more that 24 hours, even in the height of pool safety cover season. Once we have the quote, we will call or email (or both if you prefer) you the quote based on the material you have selected. The delivery time from the factory to arrive here at Pool Guard of Gulf Coast is typically six business days. 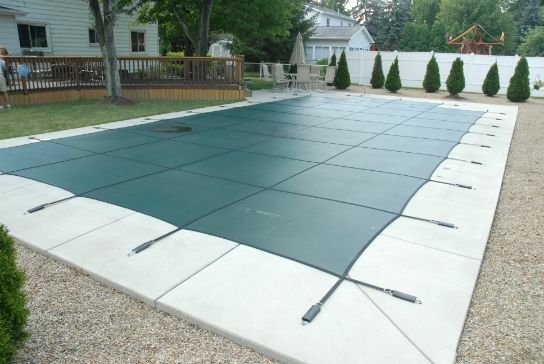 Once we have been alerted that your custom pool safety cover has shipped from the pool cover manufacturing facility, we will contact you to schedule an install date. 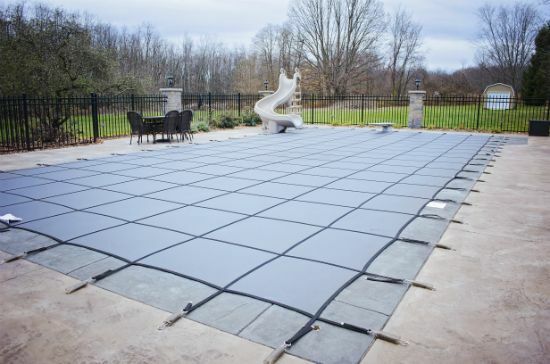 The installation of your new pool safety cover can take from three to five hours depending on the complexity of the pool safety cover (cable systems tend to add to install time). The cover is made of a polyethylene material with straps sewn in three to five feet apart (depending on the stress load or size of the cover based on ASTM standards). Each of those straps spanning from one end of the cover to the other have a stainless steel compression spring on the end that hooks to brass ground anchors. The brass ground anchors are ¾” in diameter and have a cam that can be twisted up or down (up when pool safety cover is in use and down, flush with the deck when the pool safety cover is not in use). Each pool safety cover includes a storage bag, an installation and removal bar and an extended length hex key for turning the anchor up or down. 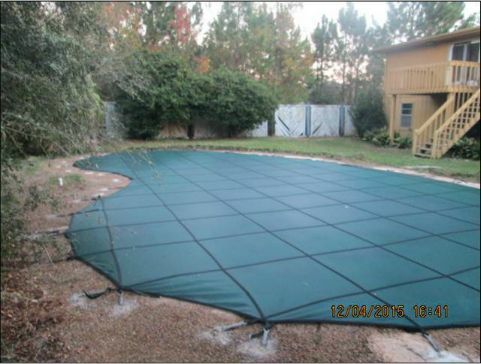 Pool Guard of Gulf Coast typically sets the compression or tension of the springs on pool safety covers at sixty percent or more to create a “drum tight” cover. The warranty on your pool safety cover will depend on the product you select. Pool Guard of Gulf Coast offers three different types of materials as well as a variety of colors for each respective material. Your Pool Guard of Gulf Coast will review the options of the product, colors and their respective warranty when they take the measurements for your pool safety cover. Please give us a call today 850-444-8596 for your free pool safety cover estimate.